Cut cherry tomatoes in half. Heat butter or oil in small skillet over medium-low heat. Add tomatoes to skillet and cook, stirring occasionally, 15 minutes or until tomatoes are very tender. Season with salt and pepper to taste. Bring a large pot of water to a boil and cook the pasta until tender. Take out about 1/2 cup of the pasta water and set it aside before you drain the pasta. 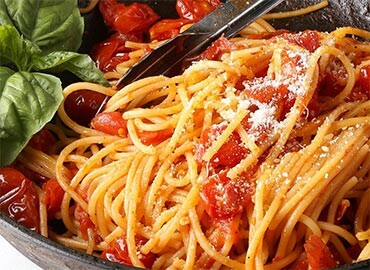 Add the drained pasted to the cooked tomatoes and toss, using a bit of the reserved pasta water to create a silky sauce. Add fresh basil and grated parmesan and toss to combine.